**Attention** No husbands were harmed in the making of this gyro. Yes, I had to make that statement, because my husband is not a spicy food fan, like me. 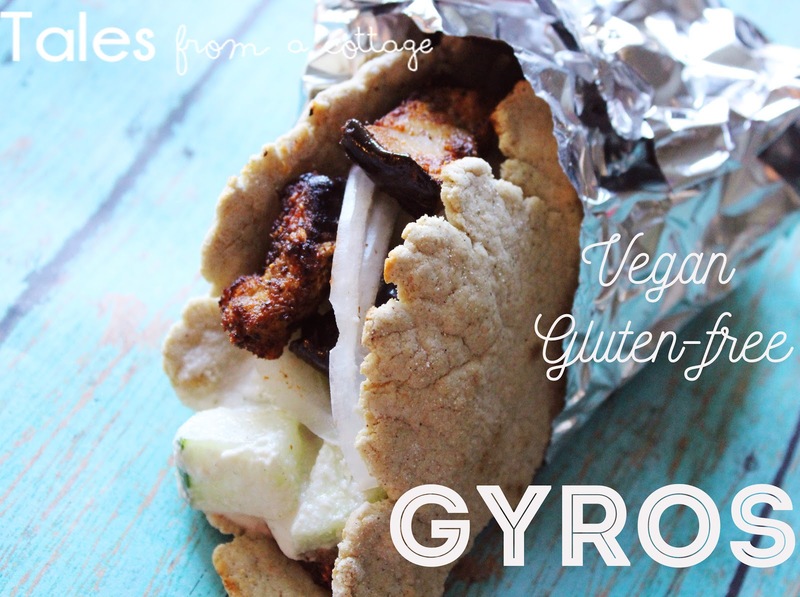 These gyros definitely have a kick, but you can absolutely adjust the spices to fit your taste buds. He powered through the spice and even went back for seconds, so thats a true testament to how delicious these babies are! If you have followed me in the past, you know I have had some pretty serious health issues over the past 4-5 years. I've taken matters in to my own hands and have tweaked my already very clean diet to improve my healing to the highest possible factor. This includes avoiding meat, gluten, and dairy. It's farmer's market season, so this helps to amp up my creativity in the cooking department based on what's growing in the garden and what's new at the market on Saturday. This meal was a huge hit for us! And, if you do eat dairy or don't worry about being gluten free, you can make it based on what you have on hand, (that's basically what I did!) I hope you enjoy!! This may seem like a lot of work, or like it will take forever to make, but I had this done and on the table in less than 40 min. You could even save time by purchasing pitas or flatbread in the bakery. I'll share the order that I made everything. Instructions: Get eggplant roasting first. Preheat oven 400° F. Cube eggplant into 1 inch pieces. Coat with olive oil and spices. Taste to check that seasoning is to your preference. Cook in a baking dish for 30 minutes. Make flat bread while eggplant roasts. Combine all of the ingredients in a food processor, fitted with a dough blad or a stand-mixer. Mix until a ball forms. Or use your hands to form a ball if you don't have a mixer. The ball of dough should be soft, pliable, but not sticky. If it is sticky, add flour by the tablespoon until it no longer sticks to your fingers. Transfer the ball of dough to a floured surface. Divide the dough in half and roll both halves into balls, and then in half again, until you have 8 small balls of dough. Line a baking sheet with parchment paper. Make sure your surface is still well-floured. Take one ball and use your fingers to flatten it into a circle. Use a rolling pin to roll the dough out into a 5 to 6-inch circle. Place the flattened dough on the prepared baking sheet and repeat with 3 more balls of dough. Lay another sheet of parchment paper over the circles and continue with the remaining 4 balls of dough (laying them on the top sheet of paper). Heat a frying pan or griddle over medium-high heat. Place one of the circles of dough in the pan and cook until bubbles begin to form (if using all-purpose flour) or the center begins to rais up from pan to create a pocket about 1 to 2 minutes. Use tongs or a fork to flip it over and cook for another 1 to 2 minutes. Remove from the pan and place on a plate. Cover with a clean kitchen towel to keep warm. Repeat with the remaining circles of dough. I set my timer for 2 minutes per side and that worked perfectly. That way I could prepare the tzatziki while those were cooking. Refrigerate for 3 to 4 days. If flatbreads seem to crack in the middle when folded, wrap a damp paper towel around it and microwave for 15-20 seconds to make is softer and more pliable. Now on to the sauce! Drain the cashews and add with all other ingredients (except for the chopped cucumber pieces) into a blender and process until smooth. ***You could prepare this the day before and store in the fridge if you like. It seems to get better as it sits. Once all of your flatbreads are cooked and sauce is made, the eggplant should be just about done. This makes enough for approximately 8 gyros. Layer your flatbread with your tzatziki sauce, eggplant, thinly sliced onion, and maybe even some extra cucumbers or tomatoes, or whatever toppings your little heart desires! We recently went under a name change with our local flower farmer business. Lola, our black lab was the original namesake for the business, "Black Dog Homestead," but we decided to change the name to something more flower focused. The new name is "Bushel and Peck Wildflowers," and we have been busy bees prepping for this year's flower season! Lola was not even offended that the logo and name changed. She has been such a good sport that she agreed to still be our mascot, and continues to model for us! 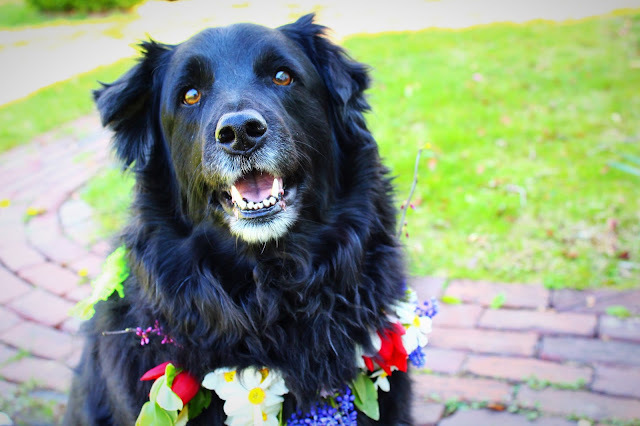 I decided to play with some spring blooms from the yard to make this flower crown that doubles as a beautiful fresh flower collar for my babes! I used tulips, narcissus, muscari, some foraged branches and vines, and some tiny little blooms that are probably weeds, but I think they are pretty and a beautiful accent!! "Do I look ok, Mom?" Lola loves to wear something special on her collar or her rain coat, or thunder shirt. She has such a big personality, and its obvious that she feels pretty by the way she prances and smiles with her eyes! Odie is the same way! They have such big personalities! This was my day today...surrounded by flowers and pets!! Doesn't get much better than that! He looks like one of the lost boys, (he he!) They totally pose! You can tell they were very proud of their fancy flowers!
" Should I do a serious face?" Being a doggy model is hard work. The struggle is real. This is only the beginning... get ready for more flower hi-jinx. We're going big this year!! The past week I've been trying to finish up indoor projects before garden season is in full swing. 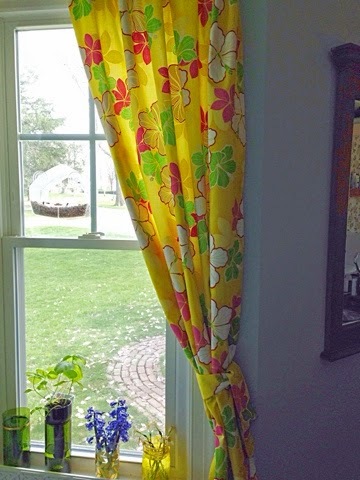 I finally got a chance to use the Hawaiian fabric I bought in Maui to make new curtains. And as you know, one project always leads to another with us! 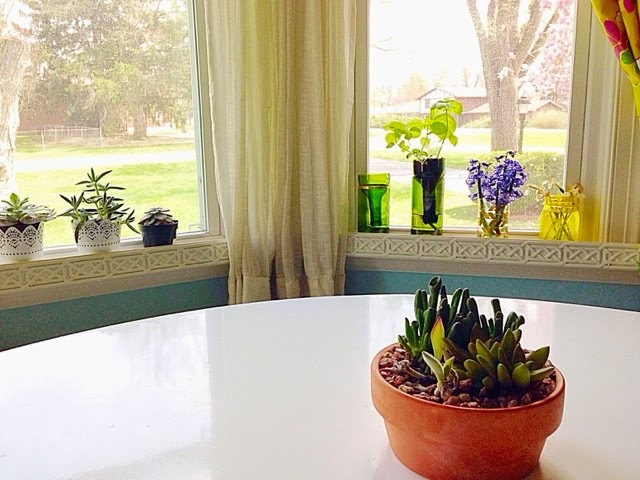 I came up with this idea a couple months ago while thinking about a way to keep plants on the window sill without the worry of them getting knocked over. 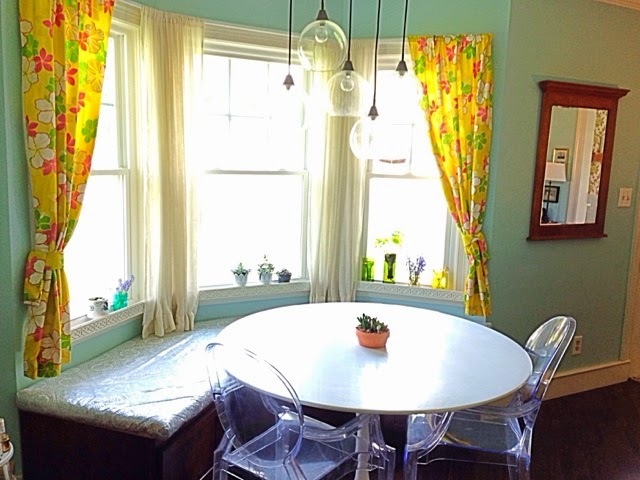 We had a few pieces of this really pretty decorative white trim laying around, and I thought why not nail some in to the front of the window sill! It looks really streamlined and polished, and has the functionality of keeping all of my pretty plants safe from harm. 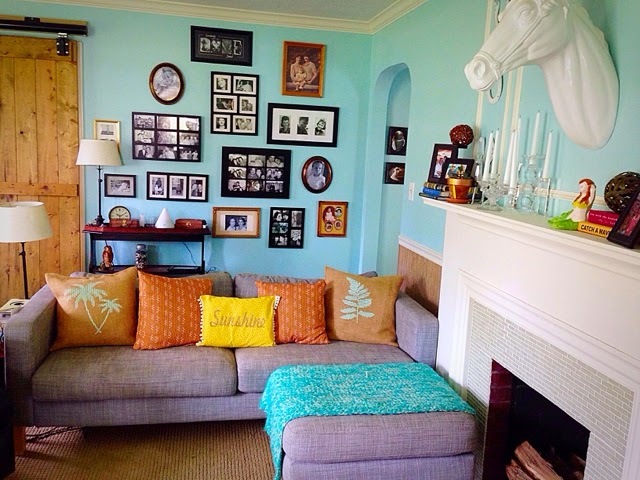 Maui is Jared and I's favorite place in the world, so we love to bring Hawaiian elements into our decor if at all possible. 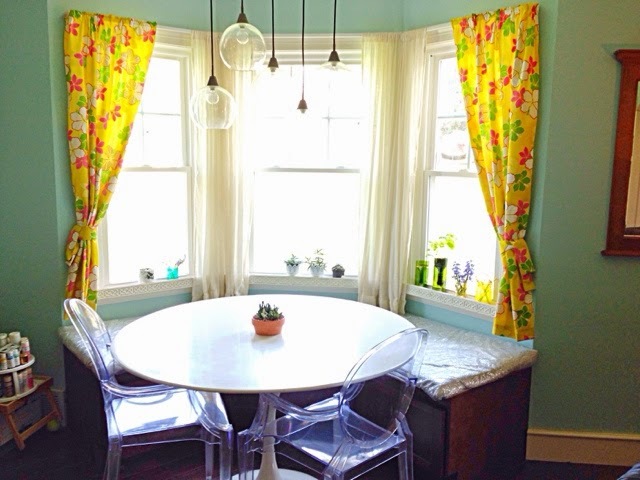 I hit the mother load at the fabric store there and brought this as well as the silver and white lace vinyl that covers the built in window seat, which is super pretty an easy to clean! 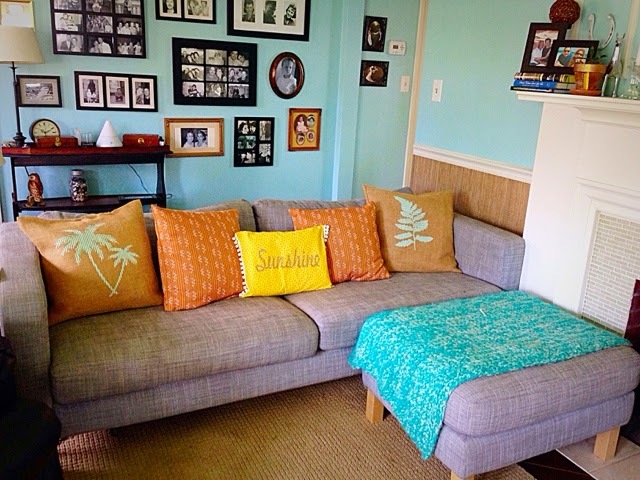 This color palate is very unexpected, and to tie the room together, I had to make new pillows. 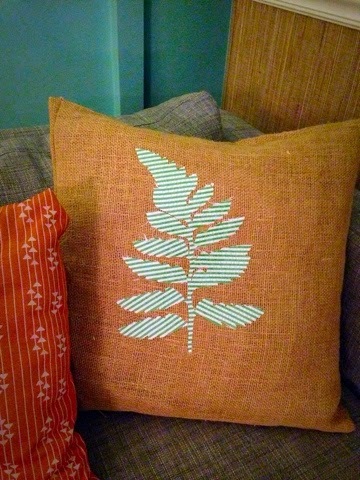 (Just kidding...I think it was just an excuse to play with my new Cricut Explore Air cutting machine. Yussssssss!) They are currently having an awesome promotion going on right now, too! 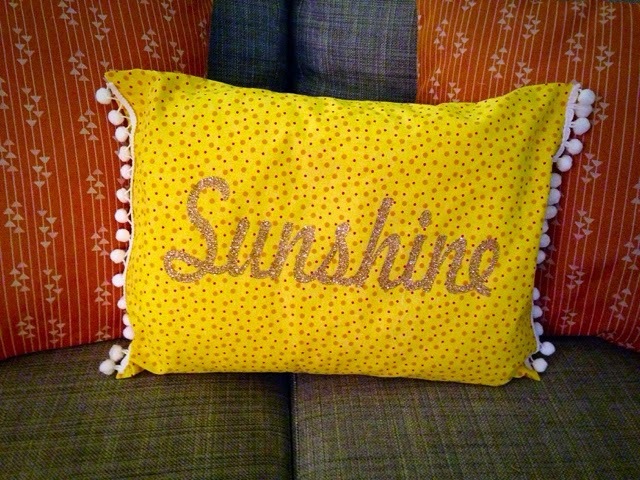 I whipped up a couple of pillows using this yellow and then some burlap to keep the beachy feel. 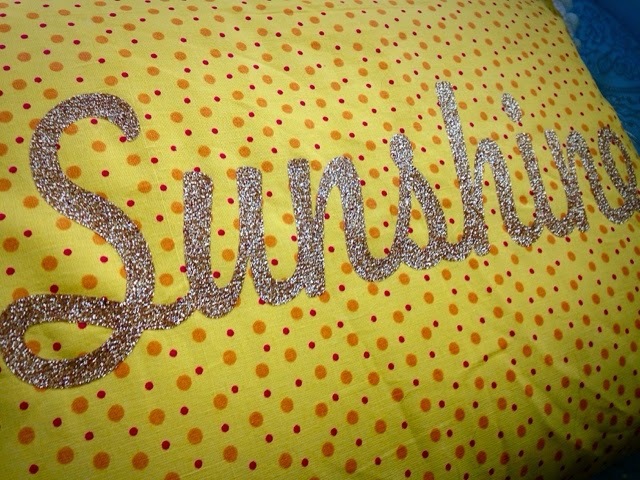 Then I busted out my Cricut Gold Glitter Iron-on Vinyl. I am in LOVE with this stuff. I wish you could better see in this picture how beautiful it is in person! My Explore Air has a cut depth setting for Iron-on which I used for the gold. I chose the designs I wanted and then my sweet little machine cut them out perfectly. I ironed them on, which took all of two minutes total for the three pillows and then promptly showed Jared my handy work! Apparently its a hit with our new little baby boy, Odie, because he thinks mama put the pompons on the sides of the pillow for him to leisurely chew on when he's lounging and not in the mood to jump down and get a toy. Anywho...here are the other pillows I used. All of this fabric was laying in my hoard, ah-hum, I mean stash, of fabrics. 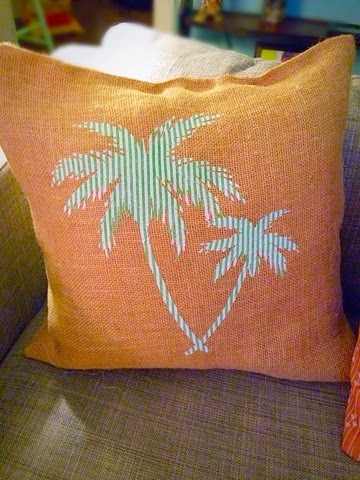 I ironed heat n' bond onto the back of the seersucker fabric and cut this fern and palm tree on the fabric cut setting of the Explore Air. It made glorious cuts!!!! Hallelujah!! Enjoy!! Please feel free to comment or message me about my experience thus far with the Cricut Explore Air! 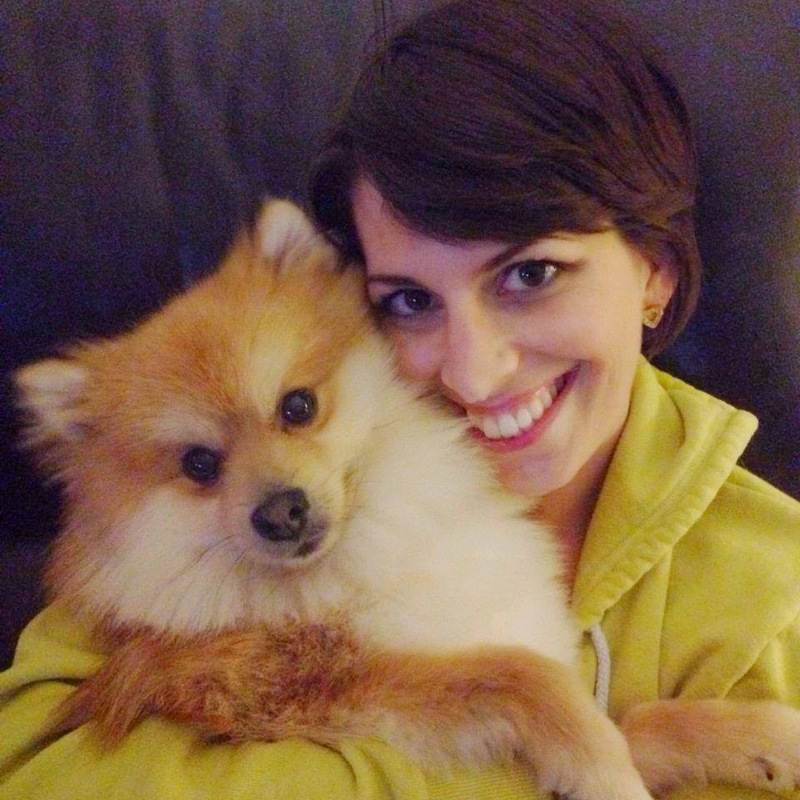 During the past year my wife Lindsay has gone through a hellish struggle with her health. One of the main culprits she’s been diagnosed with is fibromyalgia. At first, she began attending physical therapy which seemed to help in the beginning, but over time it began to feel like the therapy had screeched to a halt and wasn’t helping as much as it should. We decided to take matters in our own hands and just about everyday now we do yoga together. We came across a practice instructed by Rodney Yee that uses gentle, restorative yoga and focuses on healing any pain from fibromyalgia. Yee always has an amusing way of speaking that makes us chuckle every time, he’s become quite quotable around the house. He’s really great. Anyways, there’s several different styles of yoga, but one thing a lot of them share in common is that they focus on relaxation and meditation. One of the first, if not the first “ambient” album, this was recorded during 1978. The idea for this album was "intended to induce calm and a space to think. ", which is exactly what I find it does for me. The music consists of tape loops of different lengths consisting of acoustic piano, electric piano, synthesizers and vocals. I’ve heard Eno came up with the idea while laying in a hospital bed and hearing muffled, silenced classical music for several hours. It’s also been said he came up with the idea while being stranded at well, an airport. This man has to have at least 20+ ambient albums under his belt and I'd recommend them all! This album is a bunch of 78 records sampled and rearranged and edited, mostly old time ballroom style records. Sometimes the scratches on the vinyl are amplified to the point where they make up the majority of some songs. The ballroom scene in “The Shining” is the perfect description for this album, which I have read from somewhere else and I’m sure has been referenced many other times. This is Adam Wiltzie of Stars Of The Lid, and unlike SOTL there’s more instrumentation throughout this album and even some soft vocals! Wiltzie said these songs were supposed to be on a SOTL album, but were “too aggressive”. Aggressive is the last word that would come to mind thinking of this album, it is definitely soothing, dreamy and calming. The final song on the album, “The Struggle” is one of my favorites. The other half of Stars Of The Lid (are you beginning to notice a common theme here? ), McBride conducted this music for a documentary called “The Vanishing Of The Bees”. No surprise the sounds on this album are along the same vein as those on any of the Stars Of The Lid albums, smooth and dulcet as always. Tim Hecker, another ambient artist I discovered while working in Chicago, usually puts out more abrasive albums full of electronic glitches and echoes of white noise. (see: “Mirages”, “Ravedeath, 1972”) However, this album has a softer sound than most of his other ones. Essentially, it’s just a bunch of simple sketches that he made to dissect for a future album. The instrumentation of that album is mostly, believe it or not, pianos. Via Dusted Magazine, “In transferring 20-year-old loops from analogue to digital format, the tapes decayed, and Basinski captured the phenomenon in its rawest state as the oxide literally flaked, fell off and became dust.” Basinki was living in New York City at the time, and has said he was completing the tapes during September 11th while the Twin Towers were attacked, hints the album covers. It’s amazing to listen to the sounds slowly deteriorate. Yet, another release from Adam Wiltzie of Stars Of The Lid. Last one, I swear. He teamed up with one of the guys from Labradford for this release. Still as calm as ever. Ok, so I lied. This is the latest output from Wiltzie of SOTL. It’s probably my least favorite release from any of the projects that he’s been involved in, but it’s still good. Perfect for just sitting back or laying down and unwinding. Wait, I thought this was a list of ambient music, not techno? Well, it says ambient right there in the album title! This is basically ambient music with some beats layered in. Definitely worth checking out if you’ve never given Aphex Twin a listen. The next couple of albums listed aren’t exactly ambient and have a “rhythm section”, but they still maintain a sound that you can really decompress to. I really don’t know what to say to describe this one, thick layers of melodies from different synthesizers, laid back beats and the occasional eerie vocal samples. No other bands have touched on the sounds these guys have been able to come up with. You just need to go and listen to this if you haven’t already. This is another one of those albums that I was lucky to uncover while working in that Chicago warehouse. Polmo Polpo translates to “octopus lung” in italian. Sandro Perri is the man behind the name, I think the translation is probably a good description of the music, but then again it sounds so much prettier than the image those words draw up. The rhythm within the music sounds like being underneath waves, hell, most of the sounds on the album sound like they were recorded underneath water, or at least in an aquarium-like surrounding. This album still remains one of my favorites after all of these years, and I suppose there are a few moments where it could get maybe just a little noisey, but I still find the album to be mostly tranquilizing. I don’t think I can beat the description for this one that Wikipedia has: “Gas is a music project of Wolfgang Voigt (born 1961), a Cologne, Germany-based electronic musician. Voigt cites his youthful LSD experiences in the Königsforst, a German forest situated near his hometown of Köln, as the inspiration behind his work under the name Gas. He has claimed that the intention of the project is to "bring the forest to the disco, or vice-versa". My hope is that while listening to these, you heard something that brought you some peace and composure. If any of these strike a chord with you, then I would recommend downloading that album, or finding a physical copy to enjoy the best possible audio experience you can. In the future, whenever you’re listening to music, or experiencing any art for that matter (television, film, theatre, visual arts, etc...) always ask yourself, “How does this make me feel?"